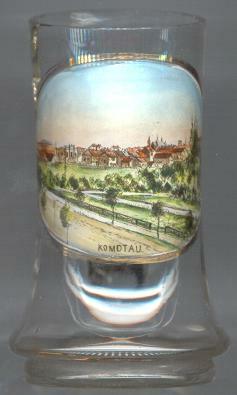 Chomutov (german: Komotau) developed on an old trading route from Bohemia to Saxonia. In 1252 it came into possession of the Teutonic Order who furthered the cultivation of the whole region. 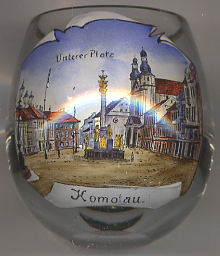 Chomutov received the status of a town in 1335 and that of a royal town in 1398. In 1421 the town was conquered and subsequently destroyed by the Hussites under Jan &Zcaron;i&zcaron;ka. Since 1594 it was administered by the royal Bohemian Chamber. The period of economical growth began in the 16th century with iron mining. The industrial development was especially promoted by its access to the railway network since 1870. As Chomutov is situated in an area rich in brown coal it soon became a centre of coal mining and steel industry. Matthäus Aurogallus (real name Goldhahn) (around 1490–1543), hebraist and rector of the university of Wittenberg, who helped Martin Luther in translating the Bible into German, was born in Chomutov. The Trinity Column [foreground centre] was created in 1697 by Ambroise Laurentis. The seven statues of saints surrounding it were added in 1725–1732. The Jesuit Church of St. Ignatius [background right] was built by Carlo Lurago in early Baroque style in 1663–1668.